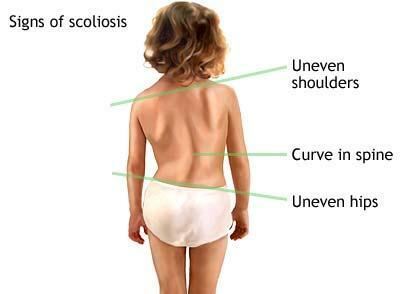 The most common curve in infantile idiopathic scoliosis is in the low thoracic region. Single curves are almost always in the thoracic region with variable amounts of vertebral rotation. As the vertebrae rotate, the attached ribs shift causing a noticeable rib bump or hump on one side of the spine. Most of the curves (85 per cent) are to the right when they occur after the age of two years. The curve doesn't always attempt to correct but when it does, a double (S-shaped) curve develops. 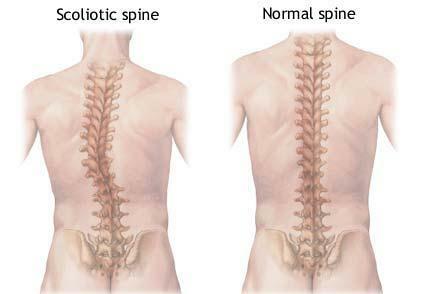 Scoliosis is a painless condition. You may not feel any change in the spine but instead notice that your clothes don't fit quite right. As the spine starts to curve, the body adjusts to keep the head in the middle over the pelvis.